Update: After using this pan nearly every day and purchasing the next size up because I loved it so much. I am sad to say it has not held up 😦 It started flaking 8-9 months into using it. I have reverted back to stainless steel frying pans and my Le Cruset – they never let me down. Katy finally convinced me to toss my flaky non-stick pans. I’ve been at a loss ever since. I love my stainless steal, but I hate the amount of oil or elbow grease I need to cook/clean. After reading an article in SAVEUR I thought I’d give the T-fal Ultimate Hard Enamel a try. IT ROCKS! 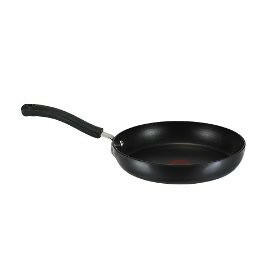 Since it’s enamel and not teflon you can use metal cooking utensils. There’s a red circle in the middle that’s suppose to indicate when the pan is ready, but I haven’t really noticed it change color at all. It also “pings” when it’s hot – maybe the enamel adjusting to the heat? I’ve had mine for three months and love, love, love it! I can even cook eggs WITHOUT ANY oil. I’ve never seen anything like it. Enough said – they’re relatively inexpensive and you can order through amazon and get free shipping! OK this is awesome! I’ve never even heard of this pan before!